Pastry Covered Awesome: An Award?! I've mentioned before that my stepsister Amanda has an amazing blog. I may not have mentioned that I'm completely jealous of her writing and photography skills, but I really am. 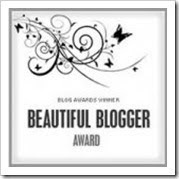 Recently, she gave me a blog award. What a sweetheart, right? It's true, she's a nice girl. Anyway, the award comes with the stipulation that you have to write seven random things about yourself. Since I know myself, it's difficult to decide what's random and what's not, but here's my best shot! 1. I love Cary Grant movies, so much so that I sometimes have Cary Grant Sunday at my house. There was an AMC marathon of his movies that I recorded and I'm slowly making my way through them. So far my favorites are To Catch a Thief and Houseboat. I'm a sucker. 2. I was in a relationship for nine years that recently ended. I'm still figuring out how to be a grown-up without my identity being so closely linked to someone else. It's weird. 3. People think I'm shy when they first meet me. Shy and nice. And quiet. This quickly changes after they get to know me. 4. I have a tendency to curse like a sailor (this is related to the previous statement). 5. I am passionate. About my family. About my friends. About causes I believe in. This also relates to the previous statement. Emotions run high around here people! 6. After learning about something that piques my interest, I can't get enough. I want to know everything there is to know about it, and then share it with everyone I meet. For some reason, I feel like the things I find interesting are also interesting to other people. Generally, this is not the case. 7. My favorite word is apoptosis, it just sounds neat. The definition is also pretty cool, I thank my genetics professor for teaching it to me (even if I didn't learn anything else from him). I still think you need to invent the Cary Grant Sunday Cupcake. And my favorite word is "bumblebee." Yours might be cooler.